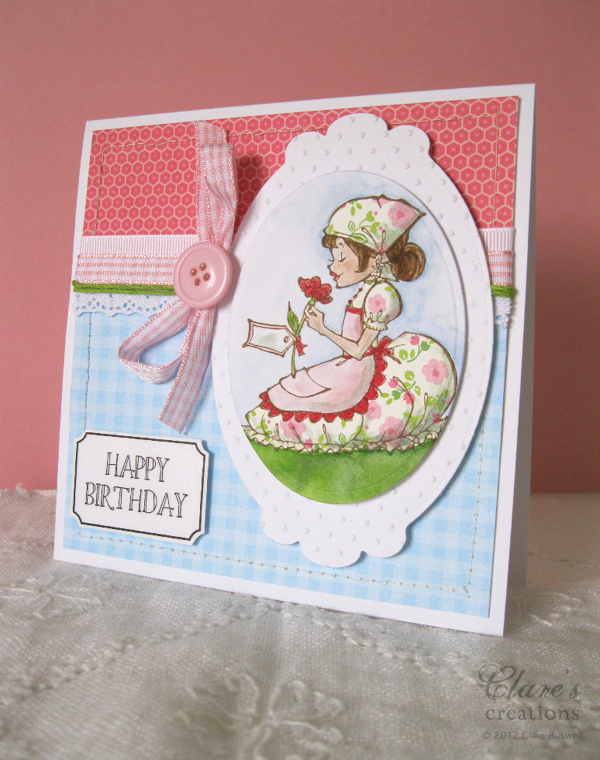 It's time for a new sketch at Card Patterns, this week we're sponsored by Sparkle Creations. 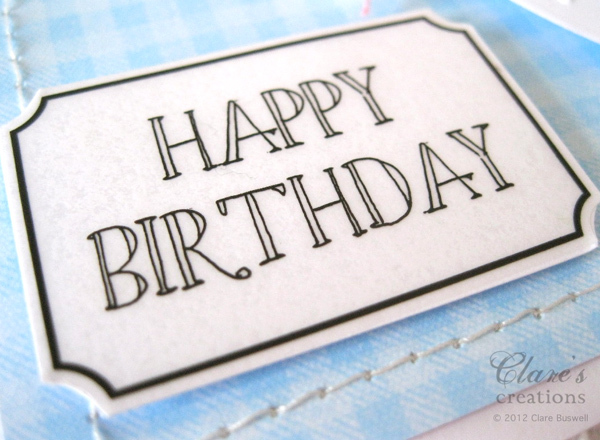 Each team member was given some rubber stamps from Sparkle Creations to use on their cards this week. Here's this week's fab sketch. 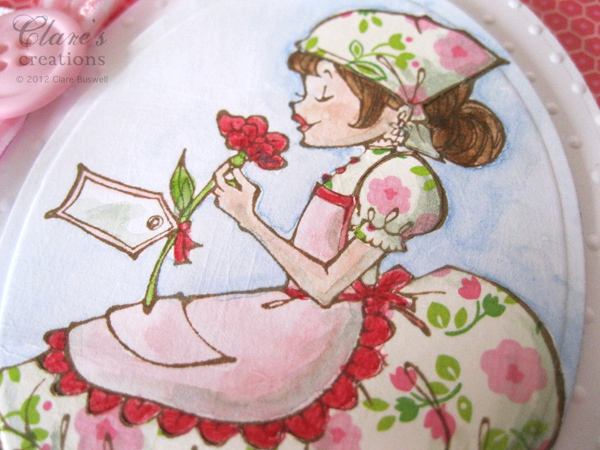 I flipped the sketch for my card so I could have the girl in the stamp facing into the card. I used Charlotte with a Rose on my card from Sparkle Creations and paper pieced the floral sections and colored the rest with watercolor paints. Once I colored the image I die cut the oval shape using Spellbinders Classic Ovals Large and layered it onto a label die cut using Spellbinders Labels 10. I added a bit of texture to the label with the Swiss Dots embossing folder. 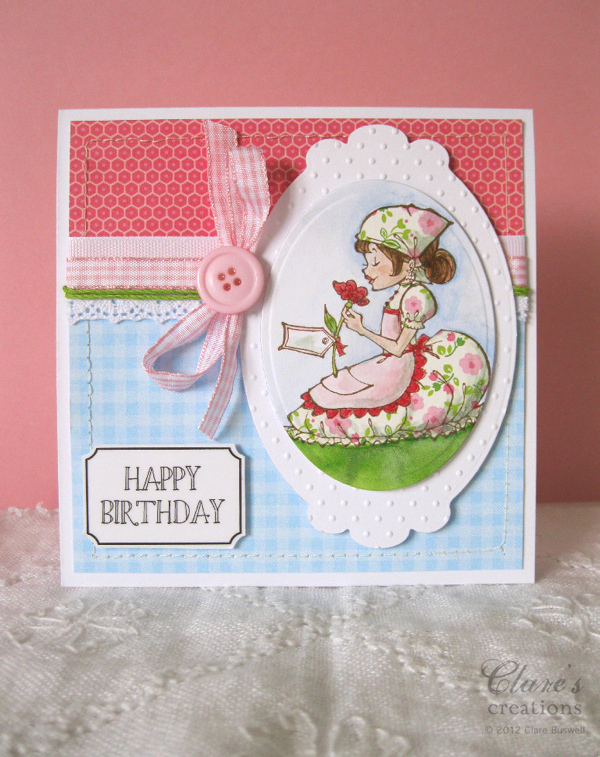 The raspberry paper and blue gingham are from Sweet Nectar by K&Co. 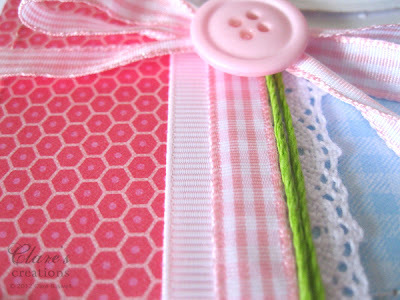 I used some pretty ribbons from the Craft Fairy, the Baby Pink Gingham and White Grosgrain. The green twine and crochet lace are from my stash. 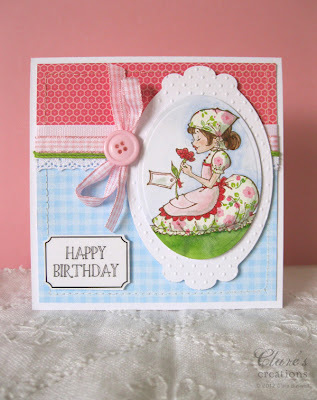 The cute sticker is from Sticker Sentiments - Birthday by SRM Stickers. I trimmed the edge of the frame and adhered it to my card with foam tape. 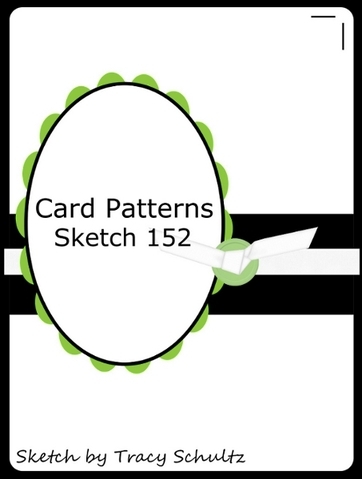 Pop over to Card Patterns to see what the rest of the design team have created this week and if you have time play along to be in with a chance of winning a great prize and an opportunity to be a guest designer at Card Patterns. Enjoy the rest of your weekend! It's feeling a lot like Spring here and I'm hoping to get out to the garden to start tidying up and planning for the season ahead! Can't wait to start sowing some seeds again! 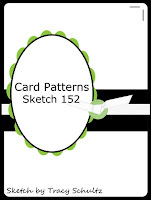 Labels: Card Patterns, Sparkle Creations, SRM Stickers. Beautiful. I wish they can be monogrammed or even embossed? Clare, love this sweet girlie card - the dress looks great paper pieced like that and your water colouring is wonderful.